Pine Creek is a narrow slot canyon that flows into a beautiful stream seen on the lower sections of the Zion Switchbacks. Hikers can follow the stream by boulder hopping and making their way through the water. Difficulty: Moderate with a lot of boulder hopping. Trail Conditions: The path is through the Pine Creek stream and along the sides of the water, over boulders and through sand. The boulder hopping can be on slippery rocks and there is unsure footing in many places. This is not a classic Zion Park Trail, but a route through and along Pine Creek. Trailhead: Third switchback along the Zion-Mt. Carmel Highway. Trailend: Same as starting point. Trail Access: The Zion-Mt. Carmel Highway is open year-round and the trail begins just off the highway. Best Season: May-September when the water is warm. Water Availability: It's easier to bring your own, but the hike is along and through a creek. Trailhead: From the east side of Zion National Park pass through the Zion-Mt. Carmel Tunnel. Drive down the steep winding road. There are several switchbacks or large winding turns. The Great Arch looms above the first switchback. This is a large blind arch carved into the mountain side. Pass the next switchback and park at the third switchback. This turn has a large pullout on the left side of the road with plenty of room to park at. There is a short rock fence across the road. From the fence the path of use is visible. The dirt path down to Pine Creek is steep and the sand is loose. Use caution. Remember this area since you will need to exit here. Pine Creek is a flash food area and should not be entered if it looks like it will rain or is raining. There is flash flood debris along the sides of the creek as a reminder. Check the weather conditions before entering this area. The visitor center has the current weather conditions. The east side of Zion National Park has spectacular settings and fun routes to explore. Pine Creek is a wonderland of boulder hopping, climbing, wildlife, flora and water. Skinny Dipping Pond: The dirt path will descend into what the locals call the "Skinny Dipping Pond." Not long ago the area was relatively unknown, so it is was possible to skinny dip here, but those days are gone. Large boulders here frame a deep pond. Refrain from diving since flash floods rearrange the area often and dangerous rocks can be present. Pine Creek is spring fed so the flow is fairly constant year-round. Pine Creek goes to the right and the left and both directions are worth exploring. Exploration toward the tunnel: Hiking in this direction will lead to a charming area beneath the Great Arch. Immediately, the trail will flatten out compared to the other parts of Pine Creek. Ahead are several pools of water, small waterfalls, flora and scenery galore. To the left, Mount Spry looms as well as a unique view of the East Temple. On the return path you can see the Streaked Wall, the Beehives and other magnificent Zion National Park monoliths. It takes an average of about 3 hours to explore from the "skinny dipping pond" to the ponds under the Great Arch. Return to the skinny dipping pond and locate the trail of use back up to the parking area at the switchbacks. Help to reduce erosion of the hillside in this area and stay on the beaten paths! Exploration: From the skinny dipping pond it takes about 1 hour to get to the parking area for the Pine Creek Waterfall route. If you are using one car, just hike up to the waterfall and return back to the skinny dipping pond to exit. This section of Pine Creek is exceptional. 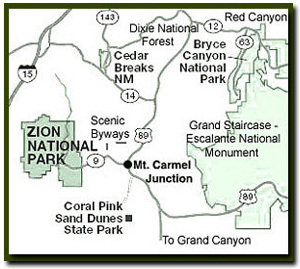 Two car option: Park one car at the trailhead for the Pine Creek Route and take another car to the trailhead for the Pine Creek Waterfall route. Trailhead for the two car option: This route will take an average of 5 hours. There is an obvious path of use from the parking area to the creek. Make your way along the creek to the waterfall. There are dirt paths along most of the obstacles, but be prepared to climb and scale some narrow sections of rock. Hike to the waterfall, then locate the path of use to the right that goes up and around the falls. Do not climb the waterfall itself. Follow Pine Creek upstream to the skinny dipping pond. Take note of this area since it will be your exit. This is the largest pool along the route, and there are trails of use up the side on the right, that lead to where your second car is parked. Continue along the creek to the pools beneath the Great Arch. Turn around here and return to the skinny dipping pond. The exit path is now on your left. Climb the steep dirt path up to the road. Stay on the beaten paths. The Waterfall: Waterfalls are not abundant in Zion and this beautiful area is easily accessed compared to the other Zion National Park hikes to similar places. Swimming in the pool is permissible. There is a sandy area around the water that is surrounded by large boulders. Tiny Canyon Tree Frogs are found throughout the Pine Creek area. Take care not to step on these tiny creatures or their tadpoles. Best Trail Features: Access without getting on the shuttle is always nice. Along this trail there are beautiful views of the Beehives, West Temple, Mount Spry, Streaked Wall and the Great Arch. There are some hoodoos on the mountaintops visible along the trail.